Todays cartoon marks the 50th anniversary of the first manned spaceflight by Yuri Gagarin onboard Vostok 1 in 1961. We tend to think of this event as part of the narrative of the Space Race: "There's Sputnik, Russia's in the lead, they have a man in space, Russia way out in front, America's catching up, America's got Apollo they're drawing level, they landed on the moon - Hurray the WEST HAS WON!!". This view downplays the contribution of what was then the Soviet Union which should be looked at again now the Cold War is over and we're not worried about being too nice to communists. Regrettably I missed all this by not being born. I grew up wanting to be an astronaut with the great stories and pictures I saw together with the souvenirs of my dads trip to Cape Canaveral but no space achievements of my own era to celebrate except boring space stations and Shuttle disasters. 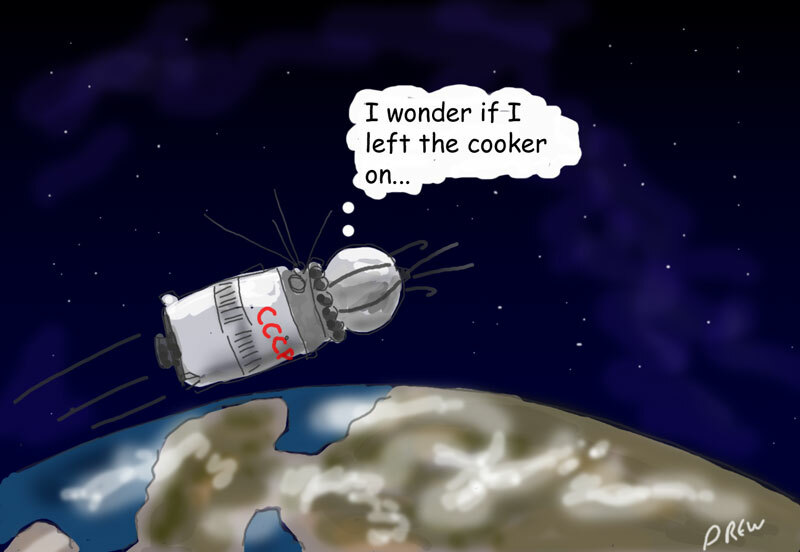 To commemmorate the event I wanted to give my cartoon a Russian caption with the translation "I wonder if I left the cooker on" or something similar. However I don't trust online translators enough and couldn't find a friend who spoke Russian in time, If anyone who speaks Russian wants to offer a caption in the comments (and we do get visitors from ru) then you can be part of this cartoon/post. Thank you CCCP and Yuri Gagarin, without your efforts we wouldn't have got as far in space as we are today.